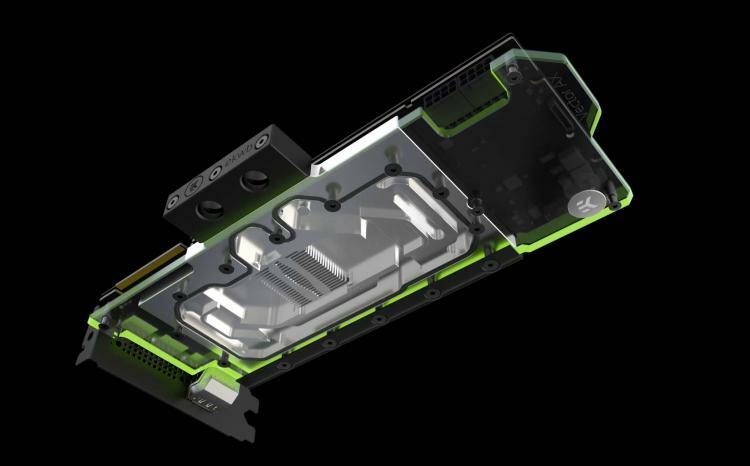 EK Water Blocks introduces the aluminium-based EK-AC GeForce RTX GPU waterblock for the NVIDIA GeForce RTX 2080 Ti and RTX 2080 graphics cards. The EK-AC GeForce RTX waterblock is an expansion for the aluminium-based Fluid Gaming water-cooling kits that offer better value and performance compared to copper-based EKWB components. The EK-AC GeForce RTX is a full-cover graphics card waterblock for the reference design NVIDIA GeForce RTX 2080 Ti and RTX 2080 graphics cards. EKWB worked closely with NVIDIA to ensure a perfect and tight fit. The waterblock delivers direct cooling to the Turing-based GPU, RAM, and VRM as coolant runs directly over these critical areas. The EK-AC GeForce RTX comes in a slim single PCIe slot thickness and also comes with a matte black backplate. The EK-AC GeForce RTX waterblock also comes with an integrated D-RGB addressable lighting solution that can be connected to the motherboard’s addressable RGB header. The RGB lighting is compatible with motherboard-based RGB lighting software including ASUS Aura Sync, MSI Mystic Light, GIGABYTE RGB FUSION, and ASRock Polychrome RGB Sync. The EK-AC GeForce RTX waterblock is now available at the EK Webshop with an MSRP of 109.90€/$109.99. Learn more about the EK-AC GeForce RTX here. Learn more about the EK Fluid Gaming kits here.